The 2012 Film Festival was highlighted by some spectacular pictures, a stunning Celebrity host and a standing room only World Premiere. (starring Mario Van Peebles, Carl Weathers and Johanna Watts) screened on April 27th at The Brikhouse (formerly the historic Manor Theater) 4 weeks before its national airing on SYFY CHANNEL. The film’s director, Thunder Levin, and several cast members were in attendance and gave a fantastic Q&A after the screening. 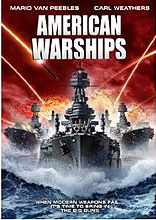 AMERICAN WARSHIPS was filmed primarily on board the Battleship North Carolina, anchored right here in Wilmington, NC. This sold out World Premiere was standing room only! 2012 Celebrity Host. This North Carolina native has stolen hearts and screen time in films such as, Friday The 13th, Altitude and Crazy Stupid Love and appearances on hit TV shows like PSYCH, CSI: MIAMI and HOW I MET YOUR MOTHER.